The news we have been waiting for, our youngest daughter Rachel gave birth to a daughter yesterday evening, after a grueling 26 hour (and that was just the time from entering the hospital) labour. Let me introduce Miss Jessica Peggy Anne Riddle, she weighs 7lbs 10oz. I see lots of girly knitting in my future - but not before I finish the boys sweaters! Congratulations Sue! She is a beautiful baby, and I love the pictures of you holding her! I'm sorry to hear Rachel had a rough go of it. You are going to have so much fun knitting little girl things! What a little beauty. Congratulations! What a beautiful baby! congratulate the parents from me, too! such a hard time,but their daughter is beautiful.I hope her mom gets some rest now, too. Is there anything better than a sleeping baby held close to the chest?!! Beautiful Jessica born into a beautiful family. Congratulations to All! What a little doll. Congratulations! Congratulations on your new granddaughter. 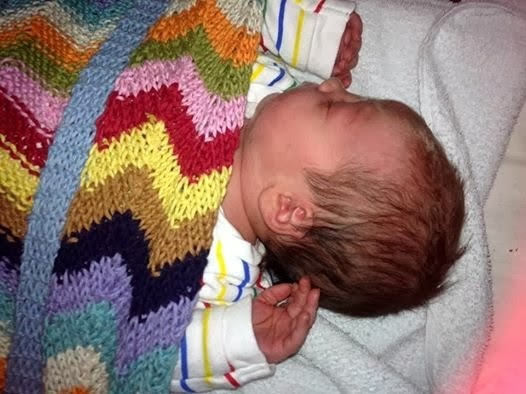 She is just gorgeous and I look forward to seeing all the beautiful handknits you make for her too. Congratulations to everyone. So glad everything turned out well in the end. She is adorable. Congratulations to the whole family. Jessica really is a beauty and obviously will be surrounded by love. think you may have the wrong person, no Maureen here. But thanks for joining the blog! Huge congratulations to you all, so exciting to have a new member of the family! Enjoy all the baby snuggles! O sweet baby! Congrats Sue, she is beautiful! Hope Baby and Mum are doing well!